The other night at dinner the girls got into a bit of an argument. Victoria has figured out that all she has to do to bother big sister is say "no" or "nope." She does it very casually. Sometimes you can see her watching for the reaction, and sometimes it is almost as if she is bored of it and simply keeps it going because she can. Shelby becomes increasingly exasperated and dramatic, and lately has started saying things like "This is ridiculous" (which she says she got from Daddy, when we asked her). We think "Come on!" is courtesy of Woody on Toy Story (complete with eye roll) and the part about arguing ... well. We might have a threenager. And we may have already had to have some talks about arguing. I'm telling you, sometimes around here things get adicious. I mean, ridiculous. 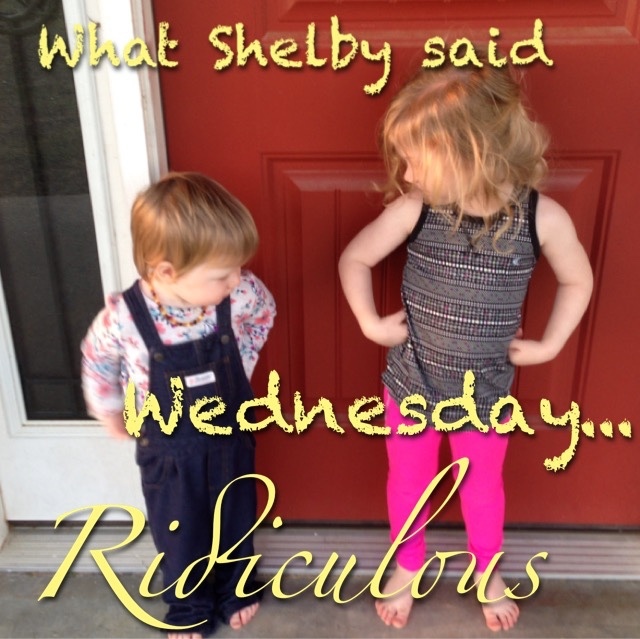 What Shelby Said Wednesday - Why?